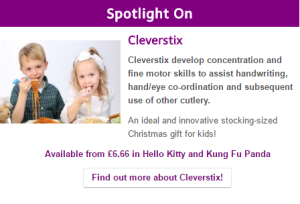 CleverstiX has been chosen by award-winning education resources specialist Crossbow Education as the product they are highlighting in the run up to Christmas. 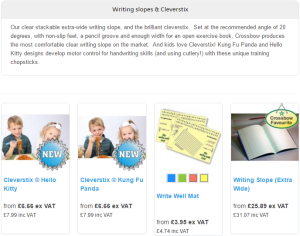 SEN experts Crossbow stock “the brilliant cleverstix” due to it’s benefits as a handwriting development aid. Such is the regard they hold the product it has been picked to take pride of place on the Crossbow Education homepage from their extensive catalogue range during the peak month of December. Crossbow are dispatching items for Christmas right up until 22nd December.